We’re well into the autumn time now, which means falling leaves, brisk winds, warm jumpers and long walks with your furry companion. Yes, autumn is the perfect time to grab your coat, load your excitable buddy into the car, and find the perfect place to escape the outside world. But where to go? Well, to help you decide, here are a few of our favourite doggo-friendly destinations around the British Isles. From sunny seasides to scenic countryside’s, here’s our 5 best autumn dog walks found in the UK. A highlight of the South Pennines, Hardcastle Crag, located in Hebden Bridge, is the perfect place to let your furry ball of energy run wild. The site includes more than 400 acres of stunning, unspoiled woodland; 15 miles of footpath featuring waterfalls and streams; and a visitor centre to kick back and relax in. Hardcastle is a must-visit for anyone looking to stretch theirs and their pooch’s legs. If you’re looking for a destination that has endless fields for your dog to go crazy with, then Chatsworth Estate is a go-to stop on your travels. Home to a staggering 1,822 acres of land, the historic Chatsworth estate is as grand as it is varied. There's plenty of walking options to choose from, with landscapes ranging from rolling hills to strolling rivers. There’s plenty here at Chatsworth to keep your four-legged friend occupied. Attingham Park is one of the UK’s most popular dog-walking spots, attracting thousands of dog walkers every year. The park has 200 acres of land to explore, a fascinating history that spans over 200 years to discover, and areas for rest including the Carriage House Café and a designated “Dog Walker’s Rest”. Take a trip to Attingham this autumn, and you'll find enough to keep you and your dog entertained for hours on end. If you’re looking for a quiet, relaxing wander, Woolbeding Parkland is the place for you. Located in the peaceful town of Rother Valley, this vast estate has a huge selection of habitats to choose from for your walking route. The landscape is a feast for the eye, from far-reaching greensand hills and commons to the gorgeous steep-side woods and pastures located along the River Rother. 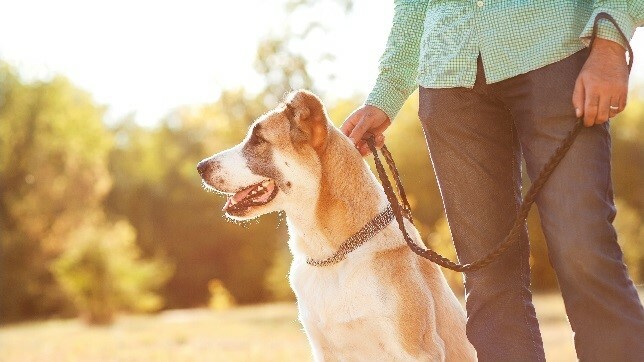 A perfectly peaceful walk for you and your canine companion. Oh, we do like to be beside the sea, and so does your dog! Yep, we all know there’s nothing our furry friends love more than diving into the water and getting soaking wet through. For this, there’s not a more perfect sandy spot than Sandymouth beach. This beach is vast and varied, including coastal grasslands, cliff top views and miles upon miles of sand and sea. There’s plenty at Sandymouth to keep your pooch entertained (and wet) all day long. Always make sure you take a towel along to dry them so they don’t get cold.